I found this video I took a few years ago of my bike commute from Maple (Keele/Major Mackenzie) to Downsview (Keele/Wilson) area of Toronto. It's about 18 km, which typically took me about 45-55 minutes on my road bike. I've moved and changed jobs since then, so no longer ride it. But between 2007 and 2012, I rode it hundreds of times. I'd sometimes vary the route, depending on my mood, or whether I was pressed for time, or wanted to explore a new area. Every ride gave me time to think, and pump my lungs, and feel the wind against my face. This video is 4x actual speed, so looks a lot scarier than it actually was. And yes, I rode on the sidewalk, cautiously and courteously, for some of busy high speed roads with infrequent pedestrians encounters (e.g. Keele from Steeles to Langstaff). It needs some cycling infrastructure. My Bike Commute in Sept 2011 from Shawn Smith on Vimeo. 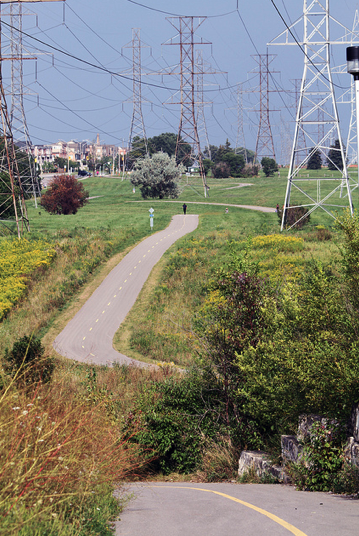 The Finch hydro corridor trail opened in 2012, providing an off-street east-west connection on my route to the Dufferin Street bike lanes north of Steeles, and on to the Bartley Smith Greenway. But it was several km of out-of-way travel, so I stuck with my original route most of the time. 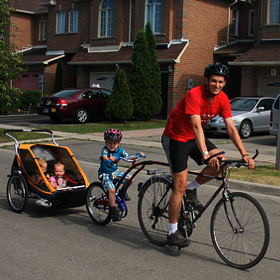 In the next few years, there are plans for dedicated bike facilities on Keele Street from Steeles to Hwy 7, as well as on Hwy 7 in Vaughan, and others. Things are looking up!